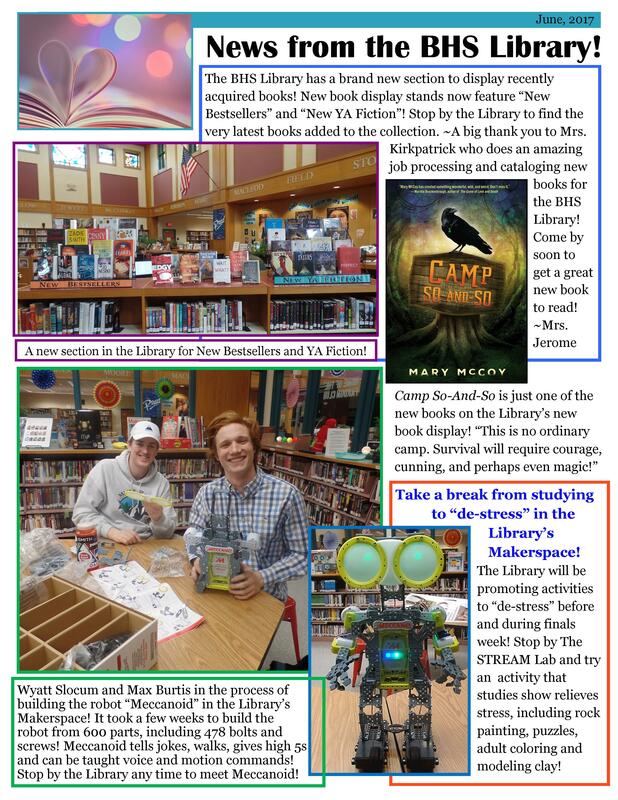 The Brunswick High School Library is a 7500 square foot facility that was completed in 1995 as a part of a new high school building. 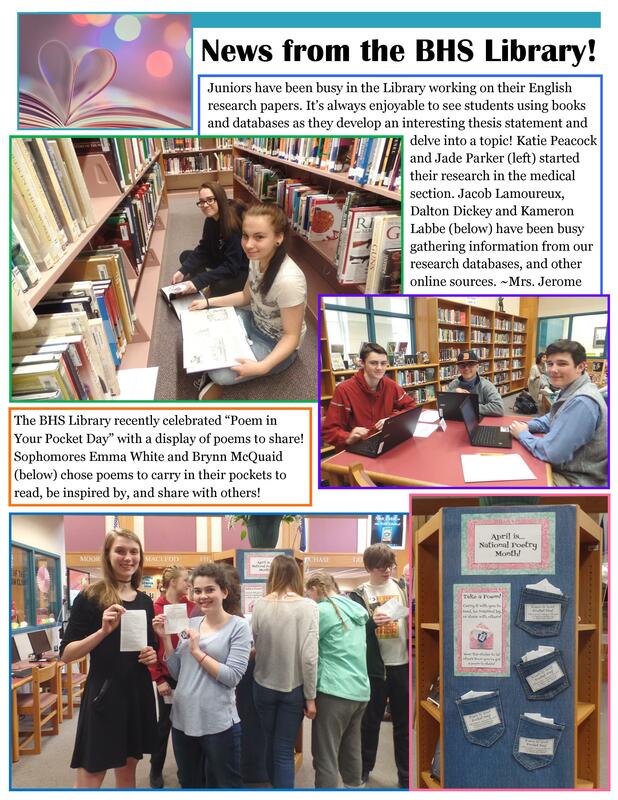 The facility was designed by Harriman Associates architect Daniel W. Cecil in conjunction with the high school library staff. 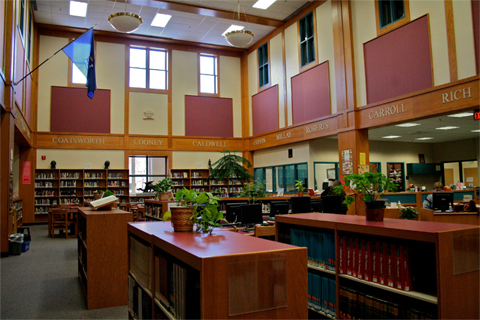 The library is on the first floor at the center of the high school facility and includes a main reading room (pictured above), entry area with circulation desk, library classroom, library office/workroom, periodical storage room, audiovisual workroom, audiovisual equipment storage room, and broadcasting studio with adjoining control room and editing room The reading room features the names of twenty-four Maine authors displayed on the oak trim. Twenty-four computers with Internet access and two catalog-only stations are available for student use. The library houses a collection of over 22,000 books, and over 2,600 videos and DVDs. Forty-five current magazines and newspapers are available in paper copy along with thousands of periodicals that can be accessed online. The Library also has a collection of more than 3,000 online reference books as well as 12 e-readers available for checkout, pre-loaded with hundreds of ebooks. 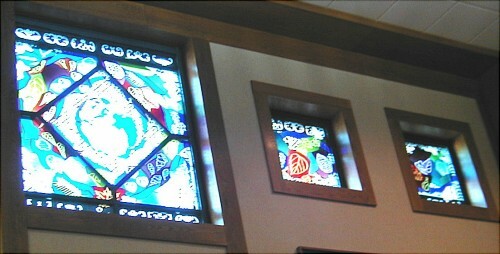 Five stained glass windows, designed by Maine artist Nancy Gutkin O’Neil, enhance the south wall of the library’s two-story reading room. Commissioned for the town of Brunswick and the citizens of Maine under the provisions of Maine’s One Percent for Art Act the windows are one of three such art projects in Brunswick High School. These windows are part of a body of work dealing with the passage of time and a sense of place. The central image is a map of Pangea, the name given to the land mass on the earth as it existed 200 million years ago. North America, Europe and Siberia are adjacent to the northern coast of Africa. Brunswick is right on the edge of where the land mass broke apart, right next to Morocco, so the artist used black and white Arabic tile patterns as a background design motif in all five windows. 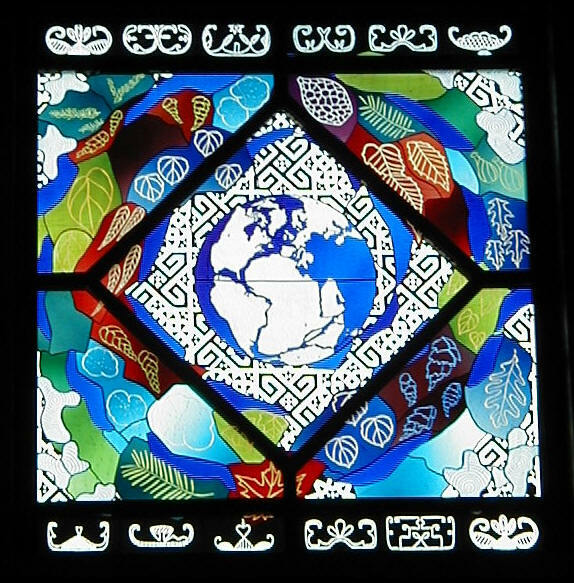 The Pangea map spins off into a blue spiral which turns into the Androscoggin river as it flows through the outer windows. Brunswick is part of the Presumscot Formation. There is a layer of marine clay found in this part of the state, caused by the underwater submergence of the land from the weight of glaciers. Since this area used to be under the ocean the soil contains fossils of sea creatures. Maquoit Bay is particularly rich in fossils of marine organisms, and the most abundant creatures are the foraminifera. These exquisite animals are no bigger than a grain of sand, but the artist greatly enlarged them and used their shapes and patterns in her piece. All of the outlined shapes that are not leaves are types of foraminifera fossils found in this area. O’Neil wanted to refer to the glaciation so she used the common map symbol for glaciers, the amoeba shapes with the light blue and white concentric circles. The leaves refer to all the different kinds of trees in this part of Maine, and because of all of the Native American relics found at archaeological digs in and around Brunswick, O’Neil included a black and white border of Abnaki double-curve motifs. Resident on the library’s north wall windowsill is a large dragon, the Brunswick High School mascot. 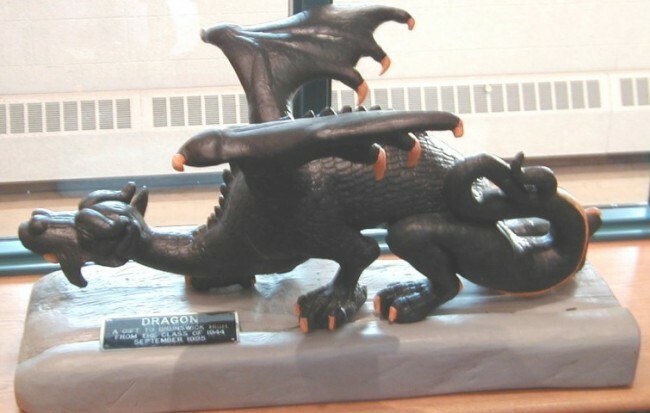 The dragon was a gift from the class of 1944 upon the opening of the new high school in 1995. Carved by Michael B. Chonko, a member of the BHS class of 1944, the dragon was conceived by the members of his class during its 50th year reunion. The class wanted to give a unique and distinct gift to the school. Made of Maine white pine, the dragon was named “Jacharorge of Day Hall” by Chonko as a tribute to several teachers, coaches, athletic directors, and school board members who had a strong influence on his life. The name Jacharorge comes from the names of Jack Tucker (Jac), Harry Shulman (Har), George Crimmins (Orge), Florence Day (Day), and Mary Hall (Hall).